BOSTON — In recent years, there has been a growing emphasis on improving the value of health care by incentivizing reduced spending and improved outcomes. One such effort is the Hospital Value-Based Purchasing Program administered by the Centers for Medicare and Medicaid Services (CMS). The program makes payments to hospitals based on several measures, including average spending for an episode of care and mortality rates for certain conditions, such as acute myocardial infarction (AMI), or heart attack. Hospitals that perform poorly in these measures receive reduced payments. 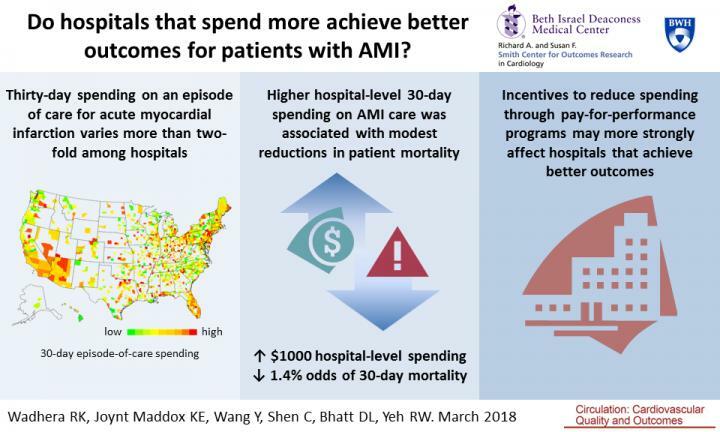 A new, large-scale study – led by researchers at the Smith Center for Outcomes Research in Cardiology at Beth Israel Deaconess Medical Center (BIDMC) and published online today in Circulation: Cardiovascular Quality and Outcomes – examined the relationship between 30-day episode spending for inpatient and post-discharge care and patient mortality following a hospital admission for heart attack.